The GDPR Assessment is a compliance assessment in terms of GDPR, the new Data Privacy European law. As a matter of fact, companies have a growing need: they need to be compliant. To this end, a GDPR Assessment is necessary. This assessment, however, not only provides for indicators showing your compliance level but it also shows a detailed overview of the situation and specific indications regarding the focus areas companies need to focus on in order to be fully compliant. Data Processing: when is a company compliant in terms of data processing? Are the processing operations carried out in the proper way? Has the company implemented the adequate measures regarding processing activities? A full GDPR Assessment allows you to have an effective mapping of the vulnerabilities related to processing operations and purposes of the data processing. Data management: this specific indicator provides for detailed information about the methodologies implemented to manage data. Who can access and manage the data? Are data, during the processing phase, being transferred? Rights of the data subject: as a matter of fact, data processing can imply risks for the rights and freedoms of the data subject. GDPR says it is necessary to assess those risk in order to implement the adequate measures to minimize them. The specific indicator of this area shows the level of these risks during the data processing. Governance: does the company have a governance structure? Has the company identified / appointed the figures required by law ( data processor, data controller, DPO )? Does the company periodically carry out awareness activities? Data protection: the GDPR assessment helps companies spot data protection flaws. Corporate websites, web applications and IT infrastructure need to be assessed to spot vulnerabilities (7 websites out of 10 have a high severity vulnerability). To carry out this specific activity you have specific tools such as Vulnerability Assessment and Network Scan. DPIA (Data Protection Impact Assessment): does the company assess the impacts of the data processing? Swascan GDPR Assessment provides a specific and punctual indicator regarding the level of compliance related to the impact assessment. Privacy by Design: this is a very important indicator. It shows whether or not the company implements the adequate measures in order to minimize risk during the design phase. 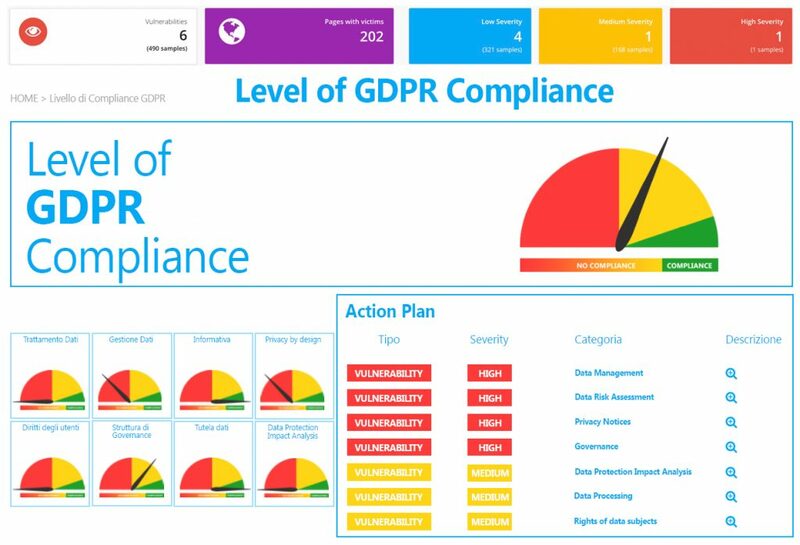 We have previously seen how Swascan and its GDPR Assessment tool provides for specific indicators regarding all of the focus areas of GDPR. However, this is not enough. There is also a concrete action plan with the specific actions to implement in order to bridge the gap with the regulation. These actions cover all of the GDPR areas. As a matter of fact, the GDPR assessment allows companies to have a complete overview of their compliance level. However, this compliance level is shown both from a generic point of view (overall level of GDPR Compliance) and a specific point of view (which is my compliance level for every focus area?). GDPR Assessment: why is it so important? The report (alongside the action plan we previously saw) you get once the assessment is done can be shown to the authorities. This report, apart from showing that the company started to follow the path to compliance, shows that the company is fully aware of its data protection vulnerabilities as well. Basically, this report has a significant strategic value. Often, the gap to bridge is very wide. However, the company has at its disposal the action plan with the actions (divided by their severity) to implement. This list is a very important resource that can easily guide the company towards the actions that fill this normative gap. Swascan developed a unique platform. It is extremely easy to use and at the same time, provides a high degree of security. As a matter of fact, Raoul Chiesa (the major italian CyberSecurity expert) is a co-founder. The detailed information regarding each one of the vulnerabilities identified is available clicking on the magnifying glasses on the right. you have the chance to start your free trial and assess the GDPR compliance of your company.